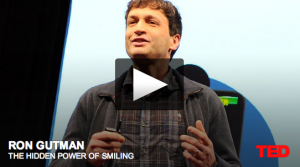 Can smiling improve your business and life? YES! If you’re like me you like watching TED Talks. I’ve watched countless talks on my laptop over the years. The talks are great for breaking up a day of work. You can sit back and relax for 10-20 minutes and learn something unique about the way humans work and interact with each other. The most fascinating talks to me are the ones that focus on how our brains work. You can learn so much about yourself and about others by seeing how our brains react to certain situations. With knowledge of the human brain, you can become a better person, but you can also learn important lessons that can apply to business. That’s what this post is about. I’ve gone through and found some of my favorite TED Talks as they apply to business. I hope they can be inspiration for you as you work to build something successful for yourself. I should have been more clear above that I really like TED Talks that discuss psychology studies. This one looks into the psychology and effects of smiling. How often do you smile each day? Do you smile in the morning when you think about seeing your family and friends? Do you smile when you sit down at the desk to start work? A smile can go a long way to being happy and to leading a successful business full of other happy people. You can be happy all the time (maybe? ), but happiness does appear to be a choice. Oh yeah, people that smile more live longer. Isn’t that worth a smile or two more each day? Get your team motivated and you can accomplish anything…seriously. If only it were that easy. In this talk, Dan Pink looks at research that could help businesses and managers figure out the keys to human motivation. It’s the holy grail of the workplace and if you figure it out for your business you could be on the path to growth. It always seems like we discover much from psychology studies. I love talks like this one that include research on the study of human interaction and inside the human brain. 3. Arianna Huffington: How To Succeed? Get More Sleep. If you’ve read the GBW Blog before you know I’m a big proponent of getting sleep each night. In fact, I feel that far too many founders and managers and executives overlook sleep and diet in their executive tool bag. If you’re not taking care of yourself you’re giving the competition and advantage and you’re not giving enough to your customers. Do yourself and your business a favor and get enough sleep each night. It’s good for your health and for the health of your business. Watch On TED: Arianna Huffington: How To Succeed? Get More Sleep. This is one of my favorite TED Talks. Margaret is an engaging speaker and the topic is a very interesting one. I’ve been guilty of being too agreeable in my personal and professional life. I keep things to myself. And I’m not always quick to disagree with people in the blogging world even though disagreements can lead to some great posts. This is a wonderful talk that can provide inspiration for life and for buisness. More studies. In this talk we hear from a researching that looks into the effect of being happy and good work. You might think that liking your work can lead to happiness, but if you change your attitude you can change your work. It’s a little bit of a Catch-22. I’m a golfer and it’s the same thing with golf. You play better when you’re in a good mood, but you’re not usually in a good mood when you hit a bad shot. Anyway, this is a good talk and it might make you smile a little and that could lead to a better workplace. Why is simplicity in business so difficult? In fact, it seems like we’re always trying to make things more complex for ourselves in all aspects of our life. We buy more things. We add more to our to-do list. We pile on and pile on. Shouldn’t we be trying to make things simpler? This is a great talk about design and how being simple can be good for business. It turns out that people do like simple. I’m a self-proclaimed introvert. I think I have been for most of my life. I prefer relaxing with a book and glass of wine on Friday night with my fiancee (soon-to-be wife; this summer) rather than going out and being among crowds of people. It’s not that I don’t enjoy being out and about from time to time. I just prefer time alone. After going out I need to recharge my batteries. It’s weird to people that need to be out and amongst crowds. It just kind of works the opposite. But anyway, this is a great talk from Susan Cain on the power of introverts. I’m biased, but I think you’ll like it. Even if you’re not an introvert you might have some on your team and with this insight you can find their motivation. Entrepreneurs don’t often do that well in school. It seems that public schools are setup to make people wonderful employees. That’s great for some, but not so great for a few others. Entrepreneurs like to break rules. They like to test things and figure out new ways to do things. It’s a unique trait that is being squashed by normal standards. Raise your kids to be entrepreneurs and you might find that they accomplish great things. This TED Talk is very popular. You may have seen it before, but it’s worth watching again. Those in advertising and sales have such insight into the way business works. They’re on the front lines seeing how people interact with brands and with products and services. It’s a wonderful talk and one of the most watched on TED. We all deal with choice every day. It affects nearly every aspect of our lives. The better we are making choices the better we can make a life that leads to preferable results. We can’t do it right all the time, but we can learn and adapt our decision making process. In this talk we learn about the complexities of choice. You can apply it to your personal life and how you run your business, but you can also apply it to the way your target customers are thinking. Now it’s your turn. Use the information above as inspiration to get moving on your next project.